Bonus Item: Enjoy Growing Your Venus flytrap!! Hey, did you just pick up an awesome new Venus flytrap from HomeDepot/Walmart/your local nursery? That’s super! Actually, that is exactly how your dear author got started with carnivorous plants some 20+ years ago (more time than I’d like to admit). Maybe this is your first, second, or even third time trying to grow Dionaea muscipula (fancy Latin name for Venus flytrap), and I know exactly how tough it can be to keep your awesome new plant producing big, beautiful traps. -I’ve definitely killed my fair share. First thing’s first. Your Venus flytrap requires distilled water. I have an in-depth post dedicated to water quality and types of distillation methods, but the bottom line, and all you really need to know, is that you should water your Venus flytrap with water that has undergone reverse osmosis. You can buy gallon jugs from your local grocery store (usually about $0.99 each), get the stuff delivered via water delivery services like Sparkletts, or install a reverse osmosis system under your sink (which, by the way, makes for excellent drinking water). Use a shallow water tray, and keep it filled during the growing season. Avoid spring and tap water – the mineral content is too high, and it will damage and eventually kill your flytrap. Chances are that your Venus flytrap came in a clear plastic container. This plastic dome is great to retain humidity (and moisture, in general), and protects your carnivorous plant in transit from greenhouse to store, and store to your home. Once you’ve got the plant home, chances are you’re going to smother the thing with love, give it enough water to keep it happy, and avoid knocking it around. 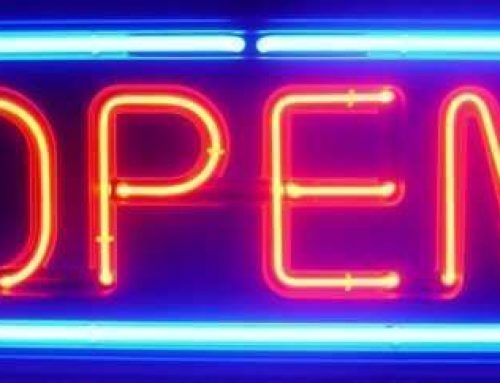 The dome has served its purpose, and it’s now time to liberate your flytrap so that it has room to spread out, unencumbered. Go ahead and carefully remove the plant from its plastic cage. If you live in a humid area, you can simply remove and recycle the plastic container. If you live in a drier region, it’s best to acclimate the plant to lower humidity levels. 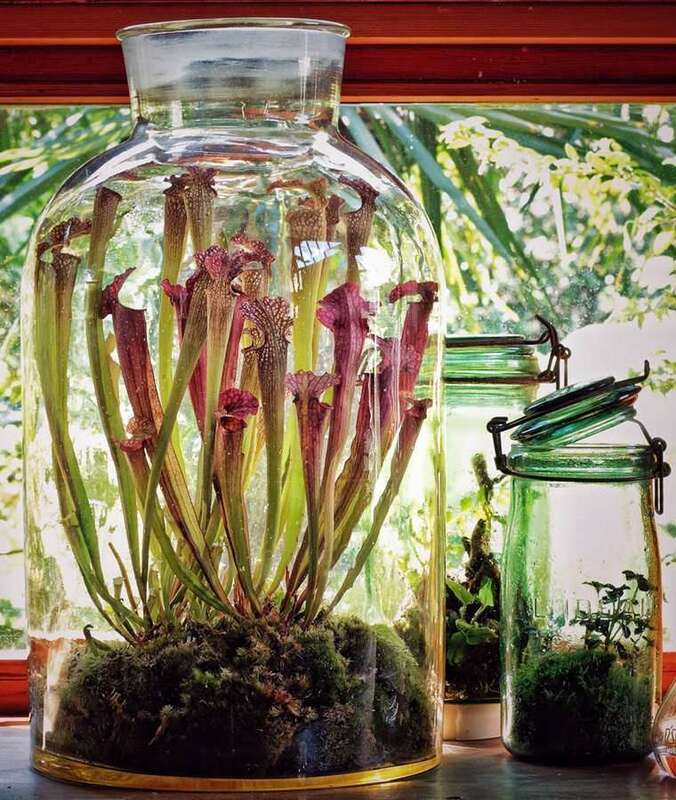 Start by removing the flytrap from its container for a few hours, then returning it for the rest of the day. Each day, remove the plant for a couple extra hours. After a few days, you can remove it entirely. Do note that without the humidity dome, moisture will be lost to evaporation at a quicker rate, so keep an eye on soil moisture, and don’t let it dry out! Your new Venus flytrap will appreciate ample sunshine. 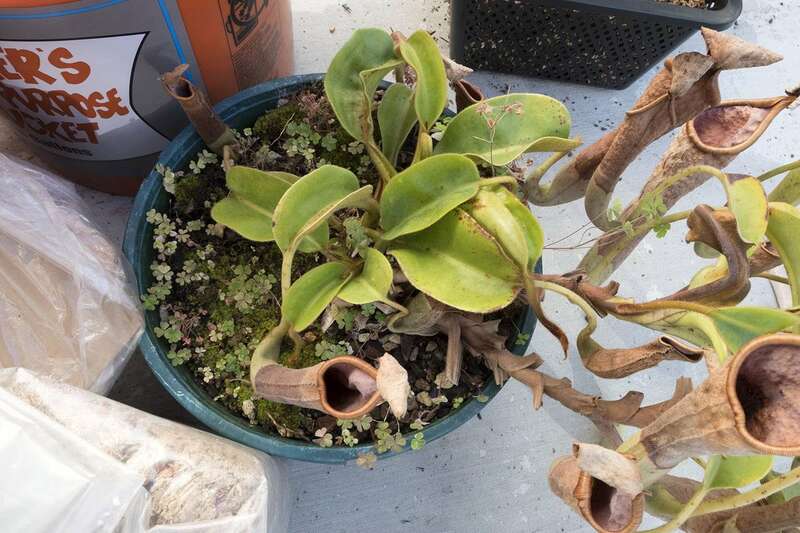 I grow mine outdoors in sunny Southern California in mostly direct sunlight (the plants are shaded from direct afternoon sun by some taller, nearby pitcher plants). Outdoors or sunny windowsills should suffice. If you picked up your flytrap from a store where it was kept inside, you’ll want to adapt the plant to brighter conditions over the course of a week to avoid frying it. Similar to the humidity acclimation method discussed above, go ahead and expose the plant to more and more light over the course of a week. By the end of the week, the worst case will be a little bit of plant sunburn. The best case is the plant will perk up and start producing pinkish red hues on the interior of traps. Remember, more sun = hotter = more evaporation, so keep your flytrap’s soil moist, but not soaking wet. I think we can all agree that feeding a Venus flytrap is the coolest thing about owning one. What’s the best way to feed a flytrap? What can you feed a Venus flytrap? Stick to bugs. Don’t feed your flytrap meat, or anything other than what it would naturally catch in the wild. Anything else will cause the traps to rot before the plant can extract sufficient nutrients from the food. Make sure the bugs are 1/3 to 1/2 the size of the trap itself, so that the trap can completely seal around the insect without it poking out between the teeth or causing the trap to bulge. Anything bigger, and the trap will have a hard time sealing and may rot. Anything smaller, and the prey may escape between the teeth. If live prey like crickets or mealworms isn’t your thing, try dead insects that you can rehydrate by soaking in water before feeding to your plant. How do you feed a Venus flytrap? 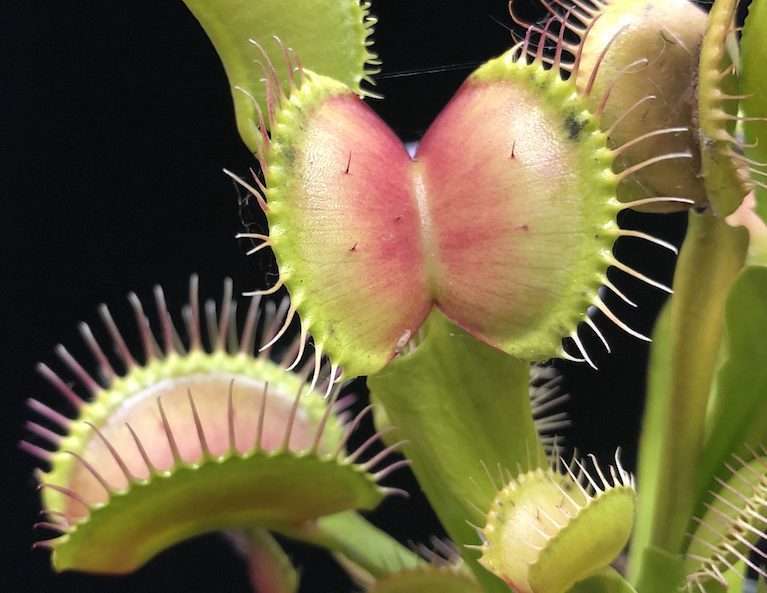 Small trigger hairs within a flytrap need to be touched twice within a span of 20 seconds for the trap to snap closed. Once it is closed, a live insect will continue to wiggle around, touching the hairs more, causing the trap to seal and digest. If you’re feeding the plant dead insects, you’ll need to slide a toothpick between the teeth and gently rub the inside surface of the trap to stimulate the trigger hairs manually. Can you overfeed a Venus flytrap? 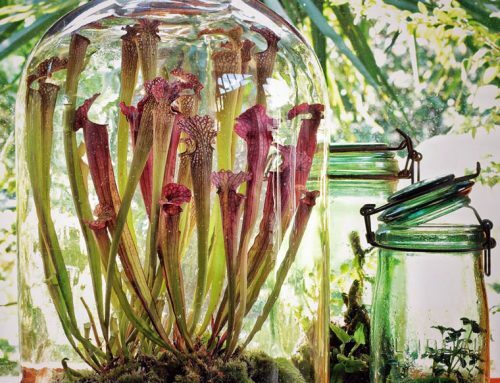 If grown outdoors, your flytrap will almost certainly catch enough food to keep it happy. If you’re growing indoors, a simple rule of thumb is to feed one trap per week. It takes a lot of energy to close a trap and digest prey. Triggering too many traps with food within a short span of time will temporarily weaken the plant as it works to extract nutrients. If you overfeed, your plant may produce smaller traps until it has a chance to recover. I just try to imagine how sleepy and lazy I feel after a big meal – it’s kind-of like that. By the way, each individual trap is good for 1-3 meals before it dies. Traps take about ten days to digest prey and stay closed the entire time. Can I play with the flytrap? Remember, triggering traps takes energy, and if you trigger too many without actually feeding the plant, you will weaken it, and it will start to produce smaller traps. Probably the hardest thing to pull off as a new grower, winter dormancy for Venus flytraps starts around November, and lasts until late February or early March. During this time, daylight should wane, temperatures should drop, and soil should dry out a bit. 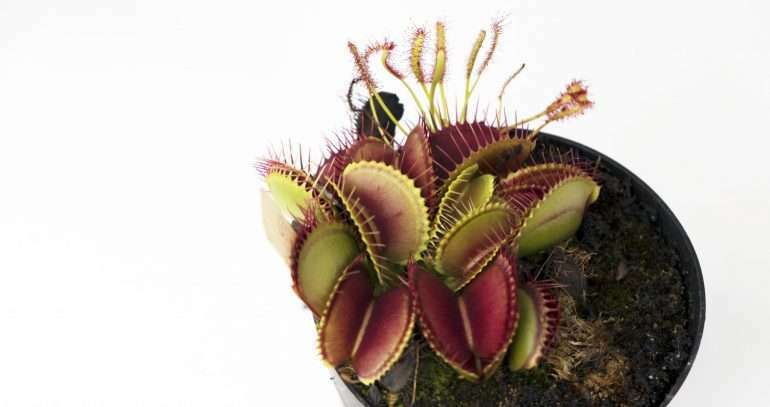 All traps will turn black and die, and it may look like your poor flytrap is dead. The hardest part is not throwing your plant out, assuming it has gone to the big bog garden in the sky. As long as you keep the soil very lightly moist, the plant will survive winter, and come back much stronger the next year. Dormancy months can shift, depending on your global location and climate – just make sure your plants get a solid 3-5 months of sleep. Without a winter dormancy, Venus flytraps will weaken and eventually die. Have more questions about your Venus flytrap? Ask in the comments section, below and we’ll be happy to answer! Let me start this post by saying I have spent MANY, many hours and days, researching and reading anything I can find about carnivorous plant dormancy. I understand what needs to happen. But I’m only concerned because I just purchased my Venus flytrap (from a reputable online carnivorous plant nursery) and acclimated it to being outdoors, I’m not sure of its age and I’m concerned about dormancy. Living in Michigan the weather here is changing constantly in the fall (50-70 during the day, 40-50 at night) I’ve left it outside for sun and still keep it in its water tray but I’ve really tried to let it be as much as possible. And am planning to do so until it starts getting below 40 at night time, then I will move it to a basement window. Thing is, It has only caught one fly, (although it WAS a big/meaty one haha) that trap died and I took it off the plant. I am THINKING the plant is beginning to go into dormancy??? (smaller traps near the soil) But I can’t tell and I am terrified to kill it off!! (probably just me being a new/paranoid owner lol) it doesn’t have any more large traps, is it OK to only have that ONE fly, to last it through until spring?? Or should I have kept it indoors this winter and waited until next year to put it through dormancy??? Howdy Nicole, I think you poked me on Instagram where I left you an answer, but answering here will help other folks with the same question. On dormancy: Venus flytraps do great outdoors in many places in the US. It is worth noting that if there will be more than a couple days of freezes where you live, especially if they’re multi-day freezes, it’s definitely worth bringing the plants indoors – same for most North American Pitcher Plants and Sundews found natively in the US. A cool windowsill with natural light is perfect since decreased photoperiod is important for dormancy. Also, make sure to resist the temptation to water your flytrap like you might have during the growing season – drier soil is important to avoid root rot during dormancy. Fluctuations in winter weather, outside of freezes, are fine. I grow my flytraps outdoors in California where we get light frost one day and 75°F+ temperatures the next. And yes, smaller soil-hugging traps can be a sign that your plant is getting ready for a few month nap. On food: Don’t stress this. Your Venus flytrap won’t die during dormancy from a lack a food during vegetative months. The plant will produce nice new traps come springtime and should be able to pick up where it left off, snacking on more flies. You’re very welcome, Nicole. Here’s hoping that Carnivorous Plant Resource continues to be a place to feed your fascination and learn! Let me know if you have more questions. I’m very excited to own my new baby, 2 Venus Fly Traps & Picture plants. It has Been about a week now & the babies look great. Can I wait until next fall for dormacy? They are just babies & have not grown to the adult size. I live in New England near Boston, but I have Wilmington NC weather on my cell to fallow its natural habitat. Yes I’m a very happy beginner & educating myself as much as I can. Thank you so much for info & time to respond. Congrats on your new plants, and welcome to the carnivorous plant club, Suzie! On your dormancy question – generally speaking, I’ve noticed that fresh seedlings will be fine for a single season without dormancy. Anything beyond this, and skipping dormancy does weaken the plant. A Venus flytrap or pitcher plant may not die in one season without dormancy, but they definitely won’t be as healthy and are likely to produce lackluster growth. I know it may be painful to watch the plants go to sleep for a few months after just acquiring them, but I promise that they’ll come back bigger and more beautiful in the spring! I am growing a venus flytrap and pitcher plant from a bulb from this territanium kit that I got at Lowe’s. The pitcher plant still hasn’t grown its pitcher and the flytrap should have grown traps by now. I’ve been taking care of them for weeks now. Help!!! Howdy Grace, don’t stress it – the plants are likely still dormant. Both Venus flytraps and pitcher plants require bright sunlight, warmer spring weather, and the usual purified water to encourage them to wake out of dormancy. If you’re located in a place with a cooler climate, they may still be sleeping. 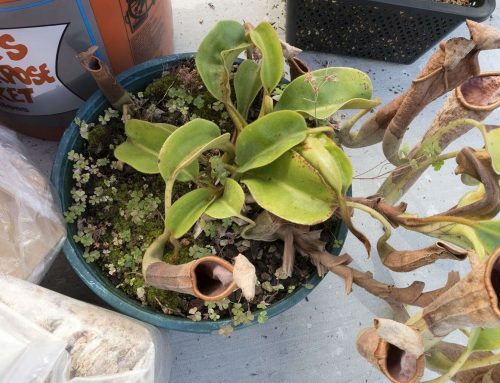 If you’re in a warmer climate, and the plants haven’t shown any signs of life, there may be other issues, but it’s hard to tell without seeing any photos. Feel free to use the contact form here to send me photos if you’d like additional help troubleshooting. I bought that same kit from Lowe’s and with the warm weather of Florida it took about a month for one of my kits but the other one I bought saw growth in a few days. Really depends on the plant. Give it time and I’m sure it will wake up. Hi y’all. I really like the website – very informative and great pics. Just wondering … do you need to fertilize the soil the flytrap is in like a regular plant? Does it need to re-potted like a regular houseplant after it grows a bit? or even right after buying? The little cups they come in look so tiny, I’d think it’d need a bigger pot after awhile. Also can you put it in a regular pot and then sit the pot in a couple of inches of water, or would that keep the soil too soggy? Sorry for all the questions, but I’m thinking about getting one of these, but want to know what I”m in for before I invest time and money. Howdy Kate, and thanks for the kind words! DO NOT fertilize your flytrap soil. Fertilizer will harm or kill a Venus flytrap. 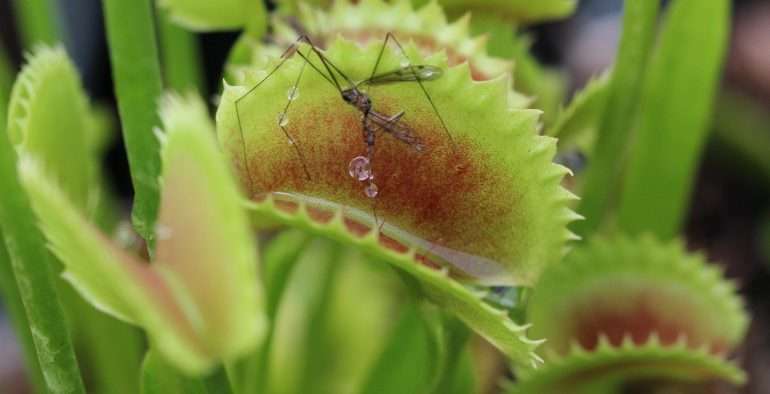 Catching bugs will provide all the nutrients your flytrap needs. You can repot your flytrap during its winter dormancy – I like to do this about every 1-2 years. They have relatively small root systems, so really big pots aren’t necessary, but they do enjoy a fresh mix of soil and a little room to spread out as they divide into more plants. A plastic or ceramic pot in a couple inches of reverse osmosis or rain water is the perfect approach – remember, they naturally thrive in bog conditions. You should totally pick one up – it’s the best (and most fun) way to learn. Let me know if you have more questions! What is the max temp that a VFT can handle? I live in Southern California and am considering keeping mine outside but it can reach well over 100° during the summer months. Winter months it will reach a low of 40° at night, with daytime temps usually staying in the 50s and 60s. Hi Teri – I also live in Southern California, and grow my flytraps outside year-round. They can handle days into 100°+ weather, but you wouldn’t want to make that the norm. Winter temperatures aren’t an issue. I am near St Louis zone 4-5 and purchased a Fly Trap I have other plants that I overwinter in my basement but I am concerned that it may not get cold enough in the basement for the Fly Trap what would the warmest temp it could handle? Outside generally hovers around 30 degrees basement temp is around 60. 60 deg. is a little warm to be hibernating your plant. I recommend temps of at most 50 degrees, and 40 thru 30 is a surer bet that your plant is happily dormant (given that it’s the correct time of year for it). If you can, find a window with enough sill to place the pot on, and put your flytrap there. Make sure that the pot is in contact with the window pane itself so that it gets cold enough. If that fails, you can keep your plant indoors, dormant in the basement, until temperatures outside regularly are above 20 or so degrees. At this point it’ll be fine to put your plant outside without too much worry. What you really want to look out for in your zone are heavy freezes below 20 degrees. If these freezes are irregular and you have a generally 20+ degree winter, all you may need to do is protect your plant during those extreme temperature drops, probably by taking it indoors and keeping it as cool as possible. If you want to keep your plant outside all year, you can place the plant next to a wall of your house and mulch it under woodchips, straw, or shredded leaves after spraying it with a good dose of sulfur-based fungicide. This should insulate is securely, and is a good idea for larger collections where you don’t want to take everything inside. There are folks out there who’ve tried refrigerating their plants, especially in warmer climes like Southeast Asia and Central America. If all else fails you can try to do this. I regret to say I am yet unexperienced with how to overwinter plants in the lower temperature zones, so the information I can give is pretty general at best. That being said, the solutions I’ve offered are probably the most popular ones for people in your zone.